Placerita Canyon was burned by the Sand Fire of August 2016. A year later the running trails are still closed. 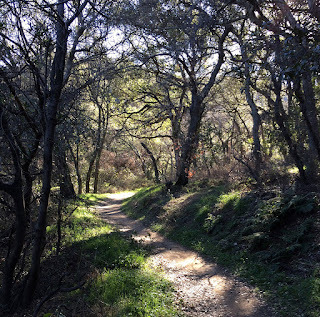 The run was 8.5 mi with 1600 ft of gain (trailhead at Google maps). There are bathrooms and water at the nature center. 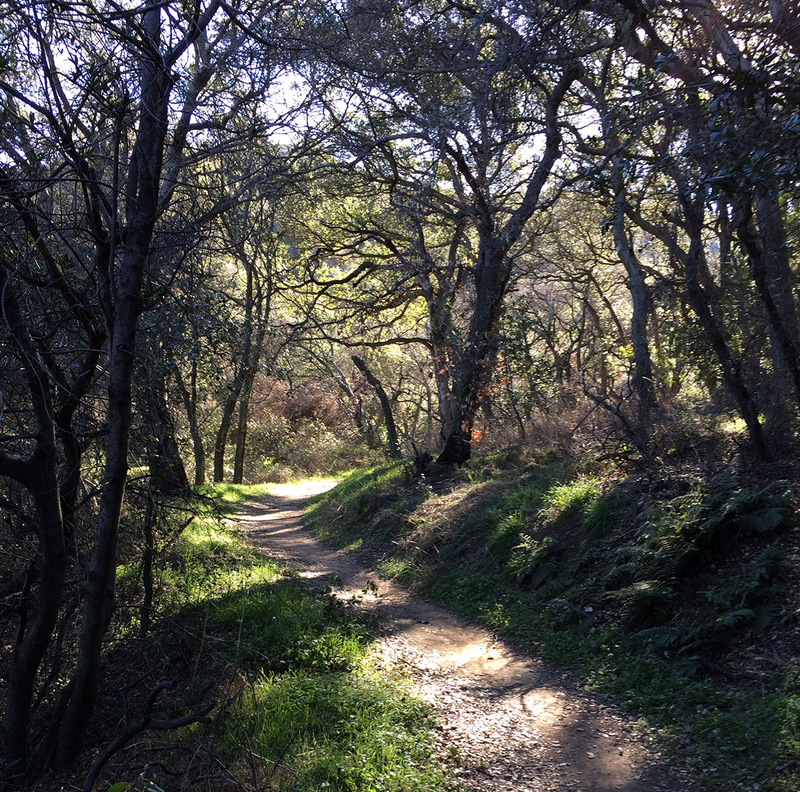 If you can only run two trails in Southern California, one should be the Ray Miller Trail and the other should be the Ray Miller Trail in the opposite direction. The area was burned by the Spring Fire in May 2013. It was mostly a brush fire: there are still sycamores in the canyons and live oaks in La Jolla Valley. The brush has since re-established itself on the slopes. More inconvenient was the heavy rain in December 2014, which closed Pt Mugu State Park. The Park has since re-opened, but the La Jolla Canyon Trail remains closed and it is not currently possible to run the complete loop as described in [50trsc]. 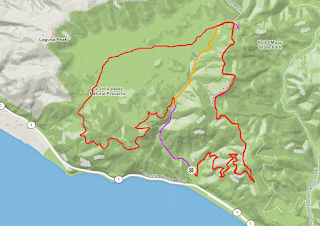 I didn't know about the closed trail, indicated in purple, so I took the detour, indicated in orange, which brought me back to the Overlook Fire Road. From there I double backed to the trailhead. The original loop is 10.7 mi and 1500 ft of gain. My route was 15.7 mi and 2400 ft of gain. Doing an out-and-back run where you turn around at the four-way-intersection marked by a purple X is 9.4 mi. 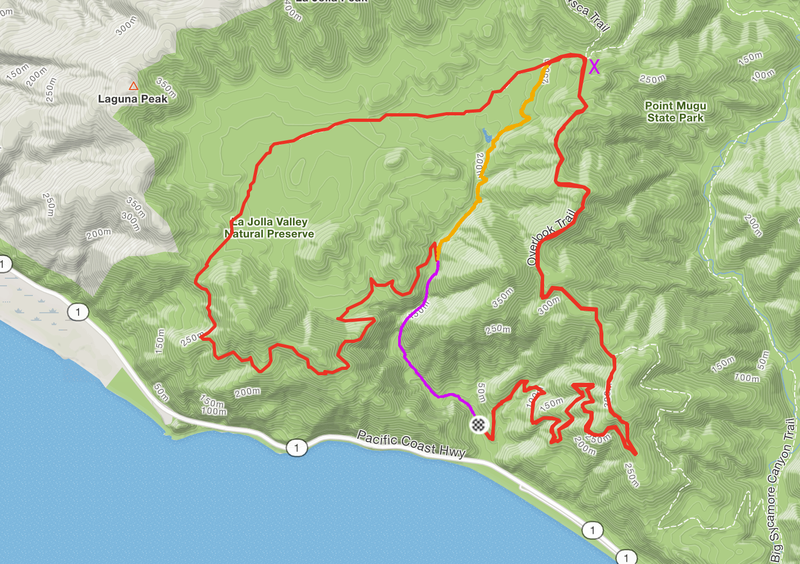 This Strava segment covers the out portion of the run. The Ray Miller Trailhead (Google Maps) is next to the gate for the La Jolla Canyon Trail. 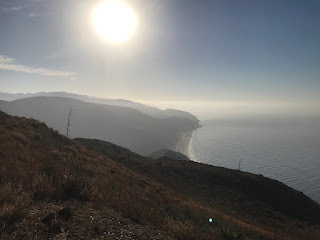 There is a fee to park in the Pt Mugu State Park parking lot, but you can park on the side of the Pacific Coast Highway for free. The bathrooms and the water fountain are still closed, but there are port-a-potties. 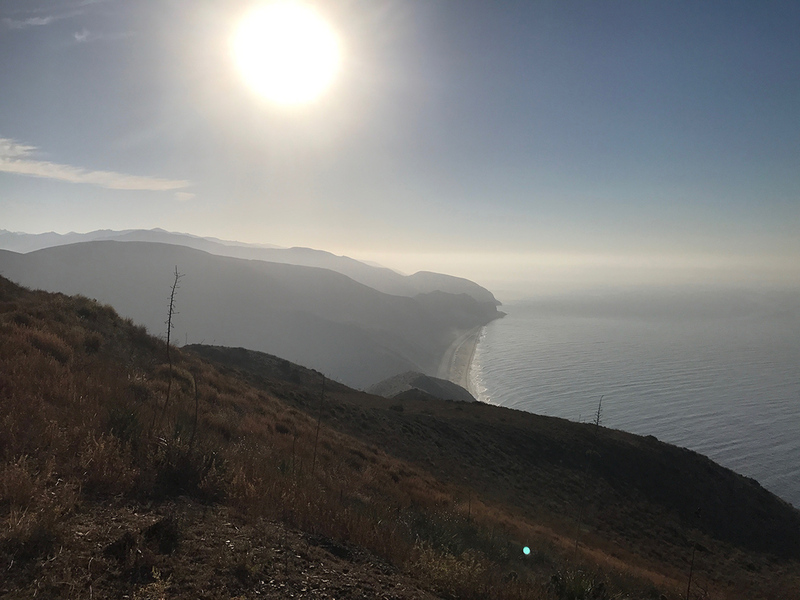 If you want to find trail runs near Los Angeles, you might take a look at 50 Trail Runs in Southern California. The book has not been updated since it was published in 2000, but it is the only resource in print. The first project of this blog is to give an update on the status of these runs. This will be fun!